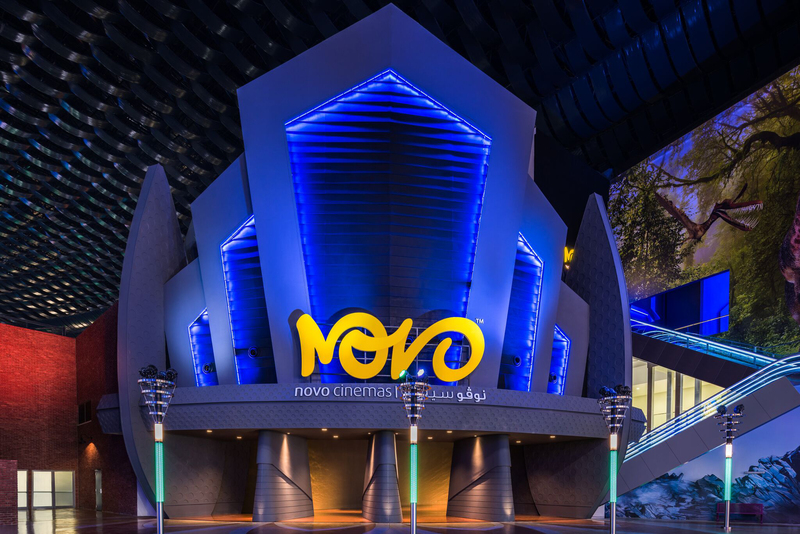 Dubai (March 14, 2019) – Novo Cinemas, the innovative and award-winning movie theatre brand, has opened its state-of-the-art flagship location at IMG Worlds of Adventure in Dubai. The largest IMAX® with Laser cinema in Dubai, Novo’s ultra-modern multiplex features a stunning ‘cosmic‘ aesthetic that boldly represents the next generation of cinema in the region. The complex boasts a 12-screen multiplex designed to fully immerse customers in the magic of the movies. The venue’s futuristic design is accentuated by more than 5,000 meters of LED strip lighting in customized colours and mirror lighting from floor to ceiling throughout the lobby and public areas. True cinephiles will revel in the IMAX® with Laser experience and the choice of three VIP screens offering Novo’s famous 7-Star service. A private lounge with dedicated fine dining menu and personal butler service is available, while fully reclining leather seats combined with pillow and blanket amenities complete the premium offering. The new experience also features IMAX® with Laser’s 12-channel sound technology with new side and overhead channels that deliver a greater dynamic range and precision for the ultimate in audio performance. For more information on Novo Cinemas IMAX with Laser Experience® including movie showing times, head to their website: https://www.imax.com/theatres/novo-img-dubai-imax.